Enjoy the breathtaking natural setting of the turquoise Wörthersee in your Austrian lakes holidays. In the heart of Carinthia we are surrounded by the picturesque Karawanks mountain range. Let the sun shine in your heart and enjoy an unforgettable time at this stunning hotel on Wörthersee! In addition to the impressive scenery and regional delicacies, a wide variety of dishes await you on the breakfast buffetat this Carinthian hotel. Leave everyday life behind you and enjoy Carinthian hospitality at our hotel. With typical Austrian flair you will feel right at home and enjoy this atmosphere from the moment you enter the spacious lobby. Be amazed! You will find our ****hotel on Wörthersee on a small hill between Pörtschach and Velden, right on the lake. The unique panoramic view of the lake makes our family-run holiday hotel in Carinthia an enchanting place. Idyllically located, surrounded by lush greenery and the shimmering of Wörthersee, our holiday hotel is a genuine paradise for nature lovers. The Ferienhotel Wörthersee is located close to the railway station Töschling (about 400 meters) and is therefore only 1 stop from Pörtschach and Velden. It is an ideal starting point for countless excursion destinations, such as the world's tallest wooden view tower at the Pyramidenkogel. The cities of Klagenfurt and Villach can be reached by car (20 minutes by car or train). These offer you the shopping and sights of Carinthia's two largest cities. You can find current timetable information at http://www.oebb.at. In the nearby Ciao Ciao restaurant (400 meters) you can enjoy a variety of delicacies on a spacious terrace overlooking Lake Wörth. For culinary variety, simply visit one of the many exquisite restaurants in Velden or Pörtschach, where everything is offered from Carinthian house manor to barbeque kitchen. Our private beach is the perfect place to immerse yourself in another world. Sports enthusiasts, bon vivants and sun lovers will find the relaxation they need here. 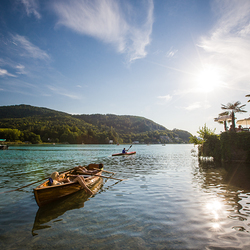 Experience everything Wörthersee has to offer! At our hotel, you will stay in cosy rooms or suites. All rooms are equipped with a shower/WC, telephone, flat screen TV, safe, hairdryer and complementary WLAN. You can enjoy magnificent views extending all the way to Maria Wörth from our lakeside rooms. Our spacious spa area with an aroma and a Finnish sauna, infrared cabin, relaxation area, solarium and Kneipp basin is the perfect place for all-round well-being. Or relax in our large panoramic indoor swimming pool on the babbling waterfall. Switch off properly for once and choose from our range of offers which includes a traditional massage as well as Ayurvedic treatment. The direct connection to the Wörthersee hiking path makes our hotel in Pörtschach an ideal starting point for all those who enjoy being active. We provide our guests with Nordic walking sticks, bikes and e-bikes free of charge. There is a variety of possible excursions for adventure enthusiasts such as the Pyramidenkogel - the world's highest wooden lookout tower. A visit to Minimundus, a park with impressive miniatures in nearby Klagenfurt, provides plenty of variety. Enjoy a proper feast in our panoramic restaurant and sample various Carinthian specialities with a fantastic view. Experience a wonderful view of Carinthia's natural surroundings from amidst the grounds of Ferienhotel Wörthersee****. In spring, the lush greenery around the sparkling lake comes to life. In autumn, the trees shine in their finest colours and, in winter, romantic walks are the perfect way to relax. Choose the right package from our range of offers for your holidays in Carinthia. We have put together great packages for your holiday at our hotel on Wörthersee.